If you are looking to lose weight, get in shape, or just wanting a new workout regimen, then The StrikeFit Challenge might be for you! StrikeForce Fitness in Chicago is looking for men and women of all ages and fitness levels to participate in an 8 week fitness challenge that is guaranteed to help you get in shape, transform your body, and change your life. Our program will not only give you great physical results, but it will also help you increase strength, improve your endurance and stamina, build muscle tone, and improve your eating habits and nutrition. You will also be provided with personal coaching from a highly trained instructor, to guide you through the process and give you that extra push we all sometimes need. At StrikeForce Fitness in Chicago, your goals are our goals and we want to see you succeed! We guarantee you will love the final result! A personal interview to discuss your fitness goals, to answer questions and address concerns, and to conduct an overall fitness evaluation. The StrikeFit Challenge will not be easy, but with hard work, commitment, and dedication, it will give you the results that you are looking for and a total body transformation. Classes are offered throughout the day, so the challenge can fit into even the busiest schedule. Since participants' availability and schedules vary greatly and we want to accommodate everyone, we are now giving participants the option to begin the Challenge on the date that they choose. Prior to your start date, however, you will be required to set up a date and time to come in for your interview and fitness consultation. All you have to do is fill out the form on the right side of this screen to request more information. We promise you won't regret it, and can't wait to see you in the gym! I attend the 1-hour long StrikeFit heavy bag class. 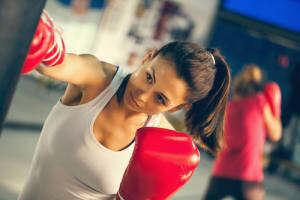 It's a great workout and the hour passes fast because there are several rounds of boxing, drills, and breaks. The class was definitely a workout! The instructor made me feel comfortable (I am a beginner and out of shape) and kept the class upbeat and fun.